Pure and simple or luxuriously ornate, your bathroom can be a practical and indulgent haven. When planning a bathroom, practicalities must come first, but with thought and inspiration from books, magazines and websites, you can create a room that reflects your style as well as being warm and welcoming, clean and calm. Think about who will use the room, how often and when, and consider the fittings you want. Sketch the room to scale on squared paper, indicating the positions of windows, doors, radiators and pipes, and allow generous space to move around in. Avoid moving pipes if possible to reduce installation costs. Plan out the electrics, marking the position of light fittings (which must be wet-rated) and perhaps a shaver socket/toothbrush charger. Shallow false walls can hide cables and pipework, while underfloor heating frees up wall space as no radiator is needed. Finally, work out what is possible given your budget and available space. 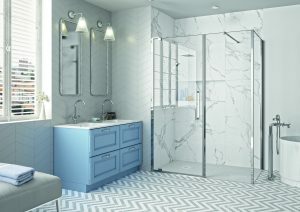 Bathroom fittings come in a multitude of styles and prices, but simplicity is often best; if on a tight budget, invest most in moving parts such as shower doors and taps. Include plenty of free-standing or built-in storage. Go to showrooms and stand in the shower, climb into the bath and sit on the loo – you’ll be using them daily for years so they must be comfortable and well made. Check products conform to British or European standards and what guarantee is on offer. Baths The more you pay, the more variety there is. A standard bath is a 1700x700mm rectangle, but there are double-ended, corner and free-standing baths. Acrylic is most common but baths made from stone, wood, copper or glass are available. Showers The three key features are flow control, thermostatic control and easy cleaning. More costly models may include constant temperature control, a hot water safety limiter, cool housing, water-saving, adjustable sprays and easy-clean functions. Basins Options include the traditional ceramic pedestal style model, winged, semi-pedestal, counter-top or wall-hung. WCs Choices include basic pan and cistern loos, the close-coupled style (where the pan and cistern are in one seamless unit), a back-to-wall WC where the cistern is hidden behind a false wall or furniture, or a contemporary, wall-hung type. A wet room is simply a waterproof, walk-in shower area with a drain in the floor, a drenching shower head and – sometimes – a glass screen. Spacious, stylish and luxurious, wet rooms can have pitfalls, especially if not on the ground floor. To prevent leaks, their walls and floors must be made completely watertight by covering with sheeting or sealant, and you need a suitable drainage slope (or a pre-formed tray), high water pressure and – to prevent condensation and mould – excellent ventilation. Previous Post:Verne The Chin Tickle Lover….